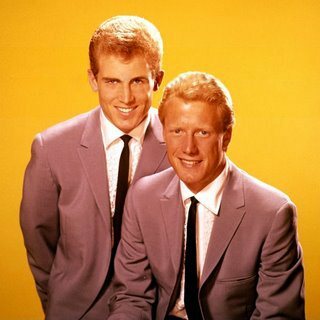 TBT: Jan & Dean, "Sidewalk Surfin' "
It's not officially summer for another ten days or so, but it sure feels like it already, so here's some summer music. Well, truth be told, this song actually charted in October of 1964, a time I remember well. I had just started my higher academic career at the University of South Florida, and there was a guy there; a tall, slender, blond guy; who had something I'd never seen before: a skateboard. He'd ride it around campus; the local terrain was slightly hilly, so he had lengths of sidewalk he could skate down. "Sidewalk Surfin' " was Messrs Berry and Torrence's attempt to expand the demographic for surf music into more urban territory. As the story goes, Jan Berry tried to write a song about skateboarding, which was just becoming popular at the time, but came up blank. He turned to his friend Brian Wilson who, with his lyricist partner Roger Christian, came up with a song to the tune of the Beach Boys' then recent hit "Catch a Wave". Of God, children, and she-bears. The Deity and I, you might say, got off in a bad way. When I was five or six, my mother would read to me from a book, published in the late nineteenth century, Bible Stories for Children: Volume 1, The Old Testament. Judging by its publication date, I can surmise that my great grandmother probably bought this book to read to my grandmother, who had in turn read it to my mother, then passed it on to her for my edification. The New Testament volume probably went to Mom's older sister, my Aunt Dorothy. This had a profound effect on the early development of my attitude concerning religion. 23 And he [the prophet Elisha] went up from thence unto Bethel: and as he was going up by the way, there came forth little children out of the city, and mocked him, and said unto him, Go up, thou bald head; go up, thou bald head. This was rendered in more up-to-date prose ("tare" I think was replaced by "slew"), and accompanied by an illustration quite similar or identical to the one at the head of this post. I know that I reacted to this with horror. I must have said something to my mother, though I can't recall what, nor can I her reply. I'm sure she tried her best to be reassuring, probably saying that God would never do such a thing to a good kid like me. Whatever she said, although I may have faked it, I wasn't consoled. I lay in my bed that night thinking that I hated God, and thinking that, at any moment, God might destroy me for that thought, just as he had the children of Bethel. In recent years, I've sometimes asked Christian friends if they're familiar with this story; usually, they say "No." 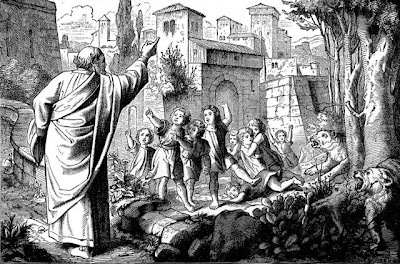 Once, I was in an on-line discussion with a conservative Christian* who allowed that the King James rendition of Elisha's tormentors as "little children" might not be accurate; that a better translation might be "young people." Indeed, the New International Version of the Bible says they were "youths" (though the New Revised Standard Version, used by the Episcopal Church, calls them "small boys"). But does it really matter whether the victims were the Rugrats or Beavis and Butthead? 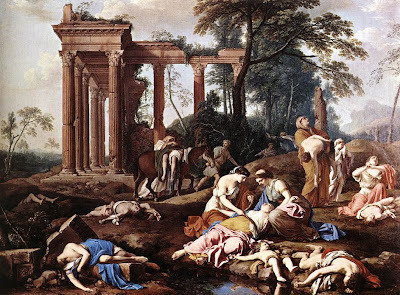 Midrash teaches that, while watching the Egyptians succumb to the ten plagues [of which the slaying of the firstborn was the tenth], the angels broke into songs of jubilation. G-d rebuked them, saying "My creatures are perishing, and you sing praises?" As we recite each plague, we will spill a drop of wine--symbol of joy--from our cups. Our joy in our liberation will always be tarnished by the pain visited upon the Egyptians. I grafted you onto the tree of my chosen Israel, and you turned on them with mass murder, and Holocaust. I made you joint heirs with them of my covenants, but you made them scapegoats for your own guilt. Holy immortal One, have mercy upon us. The "Holocaust" element in the Reproaches is obviously a very modern addition, though a welcome one. The reference in the Haggadah to Midrash indicates that the reference to God's mourning the Egyptians may have originated in the second through ninth century C.E. ; many years after the Exodus story was committed to writing. Faith traditions evolve. Does God evolve with them? Certainly our understanding of God does. * For Fray alums, the person in question is "Locdog."